Tom joined SunCommon in the summer of 2016 to lead the company’s dynamic marketing and sales programs. Prior to joining SunCommon, Tom spent eight years in various management roles at Green Mountain Coffee Roasters and Keurig, most recently leading marketing and innovation strategy for the company’s $3B coffee portfolio. Over the last 19 years, Tom has led marketing and sales efforts for entrepreneurial, category-changing companies across multiple industries, including internet/software, snowboarding, and coffee. He received his MBA from Babson College and BA from the College of the Holy Cross. 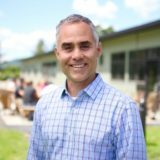 Over the course of his career, Tom has learned the power of mission-driven business, and he is thrilled to be part of the team that is making it easy and affordable for all Vermonters to go solar. Outside of work, Tom enjoys spending time outdoors with his family, especially skiing (on water and snow), hiking, mountain biking, and exploring Vermont swimming holes. Tom lives in Waterbury with his wife, Gwynne, their two children, Mason and Cassidy, and their dog, Maggie.